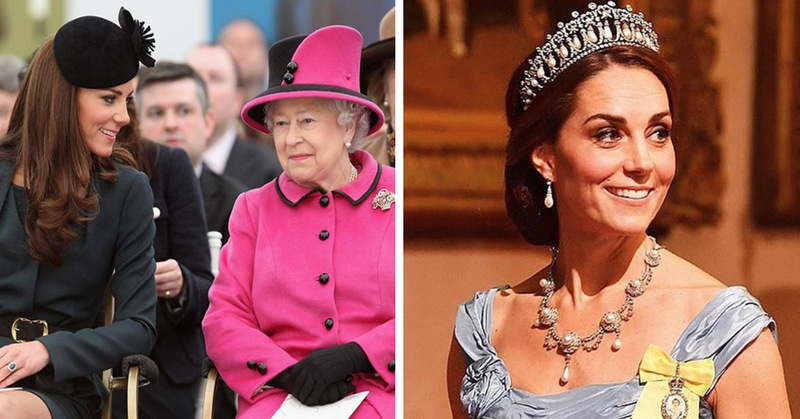 Royal Expert Reveals The Queen Has Started Giving Kate Middleton "Queen Lessons"
Queen Kate Middleton. It just sounds so freakin’ good, right?! Kate may not have been born royal but she’s taken on the job brilliantly! But there’s so much etiquette to royal life, anybody would struggle to learn it all. That’s why the Queen, reportedly, has stepped in to take Kate under her wing and teach her the ways of a queen! Which is handy, y’know, because Kate could be the future Queen of England… damn, I wish my job title was that freakin’ cool and required such nice freakin’ dresses. But as we well know, royal life isn’t just fancy dinners and sparkling tiaras, the royal family go above and beyond in their charity work and diplomacy efforts. The British public is so excited for Prince William to become King. It’s well known that Kate and William are amongst the favorites in the royal family and are expected to bring a ‘breath of fresh air’ when William takes the throne. But, as sources have revealed, it’s sometimes good to listen to the older generation when preparing for something as important as this…. Queen Elizabeth II is no stranger to the challenges of royal life. As the longest reigning British monarch, she’s had her fair share of obstacles to overcome! She’s seen the royal family and the country through the second world war, countless Prime Minister’s, scandalous news stories and an ever-changing world where the future of the monarchy can seem tentative. So, who better to show Kate the royal ropes?